At apartments in Scottsdale Serrento, we are staffed by a highly skilled team that understands your needs. Our staff will guide you through the process so you can make an informed decision. Our agents work hard to build lasting relationships with every resident. Our great location puts you at the center of Scottsdale's most walkable neighborhood, offering entertainment, shopping, dining and recreation. 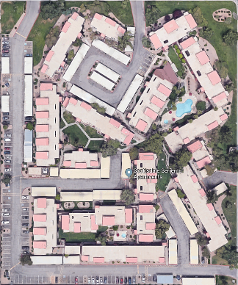 Apartments in Scottsdale Serrento are only minutes away from the Loop 101 and Fashion Square Mall. Next door, Indian School Park features Club SAR, tennis and basketball courts as well as shaded playgrounds and picnic areas with ramadas. Baseball fans would love to know that in the spring, Scottsdale Serrento are the only apartments in Scottsdale with the San Francisco Giants spring training right under their windows. At Chaparral Park you can enjoy fishing, watching the wild geese and ducks, or walking your four legged friend to the dog park with an off-leash fenced area. A 40 minute bike ride down the Green Belt will take you all the way to Tempe Town Lake. Le Cordon Bleu College of Culinary Arts has its home right across the street and Scottsdale Community College is only a couple blocks away. We are a small pet friendly community with a range of floor plans from studios to 1 and 2 bedroom apartments to accommodate various needs of our present and future residents. 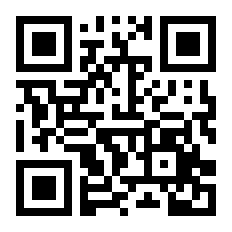 As most of apartment homes in Scottsdale, we are also participants of the Crime Free Program. We currently have a maintenance technician position open. If you are interested in applying, please click on the link below to submit your resume. 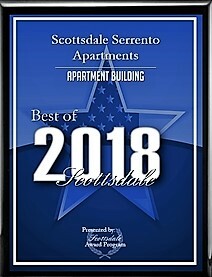 SCOTTSDALE December 6, 2018 -- Scottsdale Serrento Apartments has been selected for the 2018 Best of Scottsdale Award in the Apartment Building category by the Scottsdale Award Program. Each year, the Scottsdale Award Program identifies companies that we believe have achieved exceptional marketing success in their local community and business category. These are local companies that enhance the positive image of small business through service to their customers and our community. These exceptional companies help make the Scottsdale area a great place to live, work and play. Various sources of information were gathered and analyzed to choose the winners in each category. The 2018 Scottsdale Award Program focuses on quality, not quantity. Winners are determined based on the information gathered both internally by the Scottsdale Award Program and data provided by third parties. The Scottsdale Award Program is an annual awards program honoring the achievements and accomplishments of local businesses throughout the Scottsdale area. Recognition is given to those companies that have shown the ability to use their best practices and implemented programs to generate competitive advantages and long-term value. The Scottsdale Award Program was established to recognize the best of local businesses in our community. Our organization works exclusively with local business owners, trade groups, professional associations and other business advertising and marketing groups. Our mission is to recognize the small business community's contributions to the U.S. economy. There are only 2 pets allowed in the Studios. 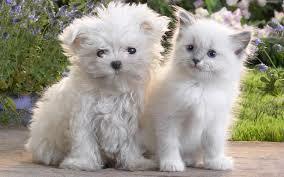 Dogs cannot be taller than 20 inches at the shoulder when fully grown. A Renters Insurance Policy including $300,000.00 General Liability Insurance is required for dog owners and Scottsdale Serrento must be listed on the insurance policy as additionally insured. Certain breeds are restricted:(agressive breeds like Akita, Staffordshire Terrier, Pitt Bull, Mastiff, Bull Mastiff, Neapolitan Mastiff, Chow Chow, Rottweiler, Doberman or a mix of any of the above).